The following is an edited transcript of remarks delivered by Michael Billington, an editor of Executive Intelligence Review, on the LaRouche PAC Webcast of March 10, 2017. A PDF version of this transcript was published in the March 17, 2017 issue of Executive Intelligence Review and is re-published here with permission. Michael Billington: I thought I would make a presentation under the title, “Why the British Hate Trump.” This is very important; Lyndon LaRouche has really emphasized that we’re not going to win this unless people come to understand that we’re dealing here with the British Empire. We always have been dealing with the British Empire. Many people thought LaRouche was either exaggerating or failed to recognize that the British Empire collapsed long ago. But now, it is very clear what he’s been referring to for forty years or more, which is that we’re dealing here with an America that has been largely taken over by the British Empire through Wall Street to some extent, but also through intelligence community operations and others. There is mounting proof for that. It is no longer the case that we’re speaking in the darkness about the role of the British Empire. We’re watching the evidence pour out, not only by implication, but in their own name. The British, in their own name, acknowledging that they are out to tear down the government of the United States, to carry out a coup against the democratically-elected government of the United States under Donald Trump. Of course, this, to a certain extent, started with the release by MI-6 operative Christopher Steele of the 35-page notorious document full of absolutely crazy, made-up stories about how Donald Trump was being blackmailed by the Russians because they caught him cavorting with prostitutes, urinating on prostitutes, God knows what else. This Christopher Steele, an MI-6 operative, had been hired by the Democratic Party, the Obama/Hillary Clinton network, to carry out this fraud. The FBI then stepped in and wanted to continue the process, and actually offered to hire him on, and apparently did pay him for something we’re not quite sure what. But this document was given to the FBI and to other intelligence agencies, and they acknowledged that there was absolutely no evidence for any of it. Nonetheless, they leaked it; it hit the press. This became the basis on which to launch this wild worse-than-McCarthy witch hunt coup attempt, based on the idea that it’s not only wrong or improper, but outright illegal to have any contact with Russia, which is an absolutely absurd notion. As Trump himself has said many times, “it’s a good thing to be friends with Russia, do you think we want a war? This would be a nuclear war, is that what you’re promoting?” We have a situation now, where Steele is still being called, despite the discrediting of this nonsense, he’s still potentially going to be testifying before the Congress. You have the same FBI which leaked this material to the press, saying quite openly that, in fact, we did get this material from the GCHQ, the Government Communications Headquarters which is the British NSA. This is serious. These are serious charges. Congressman Nunes, the Republican head of the House Intelligence Committee, has called for a hearing on March 20th which will have as witnesses James Comey of the FBI, Mike Rogers of the NSA, John Brennan of the CIA, and James Clapper, Director of National Intelligence. This is going to be quite interesting; we’re looking here at treason. We’re looking at a foreign government’s collaboration with corrupted layers of the intelligence community to carry out a coup against our elected government. These are extremely serious, treasonous-style charges. I’ll mention one other thing. Suppose it were true, which it almost certainly is not, that the Russians had somehow been involved in the hacking of the DNC and the Podesta emails. First of all, this is not national security; these are private emails of a political party, not national security issues. Secondly, nobody’s refuting that these are indeed the emails that showed that the Democratic Party was illegally, or at least against its own rules, manipulating the election to support Hillary Clinton against Bernie Sanders, and other serious irregularities. It’s all true; nobody denies it. This is not fake news. This is real news. The fake news is that these [the leaks] are not being grabbed by journalists as an example of the democratic process, getting the truth to the American people. No, no; it’s an intervention to destroy the democratic process by a foreign country, the Russians. It’s ironic. It’s insane, but it’s ironic. Now I’ll mention also that Lyndon LaRouche and our organization are quite familiar with this process. To a very real extent, Trump is getting the “LaRouche treatment.” we know these corrupt layers of the FBI. We know how they connive with the British, because this was the operation run against LaRouche back in the 1980s that led to his incarceration and my incarceration, and that of others by the Bush administration for exactly the same reason. Lyndon LaRouche had put forward, and Reagan had adopted, his proposal for working with the Russians to end the Mutually Assured Destruction madness of Kissinger and the British: that the Russians and the Americans both have nuclear weapons aimed at each other ready to fire on the dropping of a dime, meaning that we won’t go to nuclear war, because we know we’d get blown up, too. Of course, the point of this is that it keeps the world divided, and that’s the intent of the British Empire. The core of this is to prevent the United States from working with Russia, prevent Europe from working with Russia, because the empire depends upon divide and conquer: Keep the world divided. So, the same process, which was thrown against us for the same reasons, is now being thrown against Trump. And, as I think you know, we recently released a dossier on the third anniversary of the coup on the Maidan in Ukraine, where a neo-Nazi coup was openly backed by Obama and Soros and Obama’s agent there, Victoria Nuland. This was a coup to put Nazis in power, run by Obama, Soros, and others, exactly those same individuals involved today in the operation to bring down the government of the United States, the Color Revolution against Trump. And again, it’s for exactly the same reason. In both cases, this was to prevent collaboration between Europe and Russia, to prevent collaboration between the United States and Russia. Because this is the core of the Empire. It’s really the same core group who maintain control over finances and trade on a global scale, by keeping people at war with each other so they don’t object; nobody comes together to object to the imperial policy controlling global finance and trade. I was basically getting at the fact that the coup against the United States is for that same reason. Because the ultimate division of the world by the Empire, uses ethnic divisions and religious divisions, and fighting over territories and things of this sort to keep people divided. But their big divide is East and West; the big divide is keep the democratic, free West and the still-dictatorial and communist East of Russia and China. Keep them separate at all costs. This is the basis on which we can prevent the coming together of nations which could once and for all end the very concept of empire. 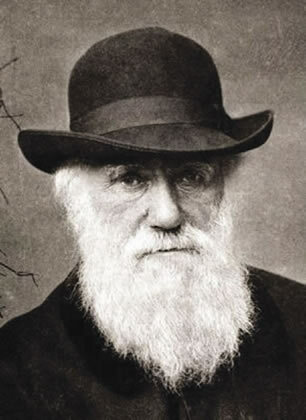 Charles Darwin maintained that humans were bestial, no different than animals: only the fittest survive. For Darwinists, those people born to be strong must be capable of defeating the weaker people. 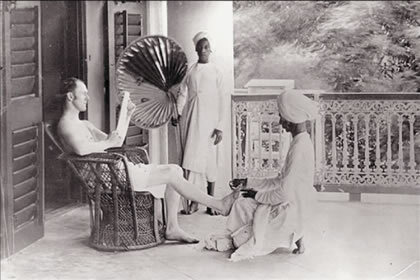 A British officer getting a pedicure from his Indian servant in colonial India. Now, what is the concept of empire? It’s divide and conquer, it’s geopolitics versus win-win. This is true; but really it’s more fundamental than that. It’s basically a concept of man which is bestial in nature. It’s a concept of man which follows the Darwinian idea that humans are no different from the animals. Darwin’s theory of how animals evolve is also false. He and his social Darwinist friends, Spencer and so forth, basically said this is the nature of man. This is the nature of human society, the survival of the fittest. Some people are born to be strong, and those strong people have to be capable of defeating the weaker people. Then they can survive in a world of one against all, an existentialist Hell of one against all. This is the core of the British Empire. they absolutely reject any concept that there can be common aims for mankind, that there can be a win-win policy, as Xi Jinping says, or a “common aims of mankind,” as Helga LaRouche likes to call it. This is rejected. If you think about Darwin’s ideas of evolution, it’s obviously false, first of all, because it’s based on the idea that things evolve by defeating somebody who threatens you. 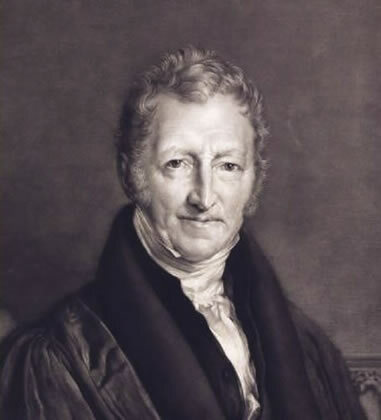 Pastor Thomas Malthus maintained there was a limit to the Earth’s human population because there was a limit to resources. But where does the evolution come from?—this is something that Mr. LaRouche has for many, many years addressed, using especially the Russian scientist Vernadsky. There’s a lawfulness to the universe, which tends to move towards higher and higher concentrations of energy, energy-flux-density, which creates an environment in which higher order principles can take place, which led eventually to the emergence of life with chlorophyll. Then eventually in the same way, through positive evolution, not a negative survival of the fittest, to the emergence of animals and especially the emergence of human beings, capable of achieving a willful increase in relative population density based upon a higher capacity to organize the universe around certain principles. More importantly, when you reach the level of mankind, you’re dealing here with a species capable of escaping from biological evolution. Escaping entirely from even what Darwin was looking at, because we, unlike animals, are not fixed, having to live within the confines of nature and the food that we have available to us. We have minds. We are capable of seeing the future, unlike animals, and we have the creative power to discover laws of the universe, which make it possible for us, then, to organize that universe to create conditions where we have higher and higher standards of living with greater population density, and so on. This is what the British reject. Take, for instance, the argument of Malthus, another British genius, lunatic, genocidalist, who argues that there’s a limit to human population because we’re going to run out of resources. Well, we never run out of resources! Every discovery made by man, be it electricity by Ben Franklin, or radiation by the Curies, or nuclear reactions like Einstein discovered, each of these redefines what our resources are. The example that we’ve always used is that with fusion, seawater becomes a resource, and even better resources like helium-3 on the Moon, can fuel mankind practically forever. We redefine our existence. This is a human idea of man, as opposed to this British imperial bestial notion of man that justifies, not only between people but between nations, the right to have a slave system, an imperial system. As I said, to return to the political side of this: the basic division of the British Empire, historically, has been this “East versus West” divide. Rudyard Kipling, one of the “geniuses” of the British imperial age, had the famous saying, that “East is East, and West is West, and never the twain shall meet.” These are almost different species. Rudyard Kipling, in fact, praised the British Raj for “bringing civilization” to the Indians. 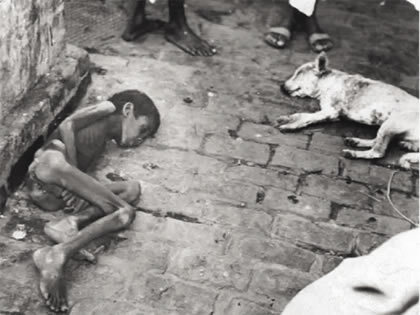 By 1943, hordes of starving people were flooding into Calcutta, India, and many of them died. Churchill refused to send wheat, saying that they were “breeding like rabbits.” According to Malthus, famine is nature’s way of culling such “excessive” population. Recently, a new book was published by Shashi Tharoor. He’s a very prominent personality, a Member of Parliament in India, a diplomat, a very educated fellow, who has been going after the British full tilt. He’s just published a book called Inglorious Empire: What the British Did to India. He points out that in 1700, before the complete British takeover, India was the richest nation in the world. It had, according to him, 27% of the global GDP of the world; whereas the British had 1.8%. I don’t know if that’s true; I haven’t read this book yet. But he does point out what I do know is true, which is that under the British, in one year, in 1837, 35 million people starved to death [in India], while the British were shipping wheat and other foodstuffs out of the country back to Britain. The British argument was “we don’t interfere with famines, because famines are nature’s expression of the limit of population. They had become over-populated, and nature stepped in to cull the herd of the human beings. 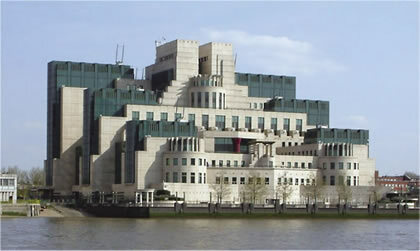 After all, we are moral people in the UK, and we believe in the morality of contracts. And to break a contract that sends the wheat back to the United Kingdom would be absolutely immoral, simply because 35 million people are starving to death.” These are practically quotes. I’m not making this up. By the way, Tharoor also points out that 3.4 million people died under Winston Churchill. He compares Churchill to Adolf Hitler, a very apt comparison. And then there’s the Opium Wars; I don’t need to go through it. These were wars by the British to literally destroy the Chinese government which was opposing the bringing in of opium from the Indian Raj to destroy the population of China in order to impose a similar kind of control. Today, we see exactly the same thing. We can’t think of these as dry history lessons. 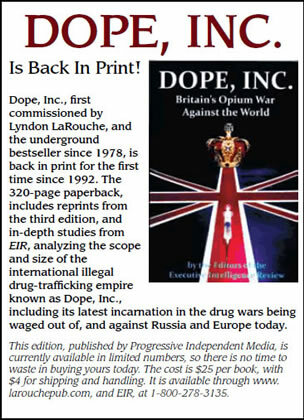 I meant to bring a copy of the book, Dope, Inc., but I forgot—the book we published first in 1978 called Dope, Inc.: The British Opium War Against America. There have been several editions, the most recent is Britain’s Opium War Against the World. The same banks that were set up in Hong Kong to run the opium wars—Hong Kong and Shanghai Bank, Standard and Chartered, the Jardine Matheson banks—these same banks are still at it today. When the HSBC was caught laundering tens of billions of dollars of drug money from Colombia and Mexico into the United States, the Obama administration said, “Nobody goes to jail. We’re going to give them a slap on the hand, a little fine, and they can go back to work, running dope,” because dope is the biggest business in the world. We’ve gone through on this show before a discussion about the fact that the head of the UN drug operation, [Executive Director of the United Nations Office on Drugs and Crime] Antonio Maria Costa, has made the point that in these crises periods, these banks depended upon the liquidity from the drug trade; in fact, all the time. It’s the biggest business in the world. As you know, while Obama was legalizing drugs across the United States, he was openly supporting both the national governments that were supporting drugs, as in Colombia, where they signed a so-called “peace agreement” with the FARC, which is nothing but a cocaine and marijuana cartel. Obama also made sure that the banks were allowed to continue unabated, because that’s where the dope business actually is run. Now we have Trump running a war on drugs, yet another reason the British absolutely hate Trump like they hated LaRouche. As you know, LaRouche started an organization called the Anti-Drug Coalition, publishing a magazine called War on Drugs. Trump has now declared a war on drugs. He’s put a general, General John Kelly, in charge of Homeland Security, who is intimately familiar with the drug crisis, who has testified to the Congress that only 20 percent of the drugs coming across the Mexican border are caught at this point, and an Attorney General, Jeff Sessions, who has spent his whole life fighting against this legalization of drugs. This is not well-liked by the British, I can assure you. Lastly, I’ll mention what Jason is going to continue with, which is that on the whole banking side of this, the British oligarchy despise the Hamiltonian system of credit. In an imperial system “money is dumb”; and that’s what the British want people to be, is dumb. They want it to be based on money so that the banks control the flow of money; the money can be spent on whatever makes a profit, be it casinos or whorehouses— unlike the credit system set up by Alexander Hamilton and used by our best Presidents, credit which has a vision, which has an idea of the future, whose purpose is to create something, to create a better world, to actually look towards a future and make something change in a way which benefits the general welfare of the population. This, I think, sort of rounds out a thumbnail sketch of the hell of the British Empire, why they hate Trump. Right now, perhaps for the first time in history, we are in a position where empire can be abolished, possibly forever, if we succeed in creating the kind of creative environment for the human race based on the common aims of mankind. Hack Attack: Pearl Harbor or Watergate? A Right to Control the Narrative, or Truth? Dossier: Obama and Soros—Nazis in Ukraine 2014—U.S. in 2017? Obama, the Maidan Führer, vs. Trump? Where Does Europe’s Real Interest Lie?